So this week has turned into a sort of half holiday, half work week. I’m working on a novella that may or may not be a commission (long story – no pun intended). Otherwise I’m doing a bit of everything: weaving, mending, gardening, cooking, reading, walking, painting and enjoying a cuppa out on the deck in the welcome spring warmth. I’ve done a little bit more of Stylebooking, adding a few garments I’d missed, and a bit more culling of the wardrobe. Five of my long-sleeved tshirts are from Uniqlo. They’re supposed to be a cotton polyester mix. I’m sure they were thick and cushy when I bought them. I don’t like flimsy t-shirts, so I’d have never bought them if they were. But after a couple of washes they’ve were all thin and now have that squeaky quality polyester has. After some deliberation, I’m going to donate them to the op shop, as they are still wearable if you don’t mind the feel of polyester. I still have plenty of long-sleeved t-shirts to last me through spring, and if I find I need more next winter I will buy some ethically/sustainably made ones. Last weekend was all about craft. Saturday I went to the guild for the weaver’s meeting, then stayed on to try to fix some looms. The talk at the meeting was about using a fan reed on an Ashford table loom. The simple and ingenious way Mary hung the reed gave me a great idea for using the Vari Dent Reed on my Katie loom. The loom mending went well – at least, I hope my solutions worked! One loom I couldn’t fix on the spot. Someone has replaced a missing pawl pin on one of the Ashfords with a screw, which is inelegant and not particularly successful. I’m going to have to come up with an inexpensive way to undo the damage. On Sunday afternoon I hosted another Craft Day. Three lovely hours of nattering and craft with friends that felt like three minutes. I started with some bag mending and refashioning followed by cutting up t-shirts ready to weave more seat pads. I’ve finished those pads now. I’m in a bit of a finishitis phase at the moment. 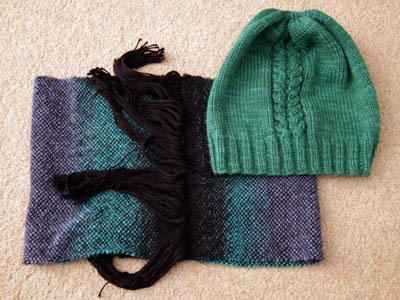 I still have to sew up the red jacket and finish the green beanie, and those bag refashioning projects. And then what? There are some more variable dent reed ideas lurking in my visual diary, and my wardrobe edit hasn’t put me off weaving some summer weight fabric for clothing. 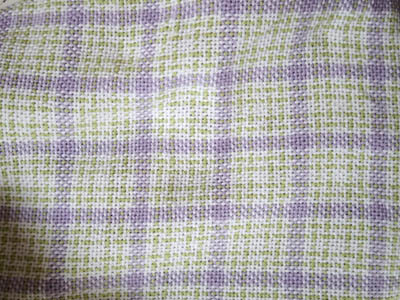 I also want to machine knit another cotton garment out of the white, green and purple Bendy Cotton in my stash. And I have a few clothing refashions to do. Plenty of projects to finish. Plenty waiting to start. The trees here burst into blossom weeks ago, but it still felt like winter. Then a few days into Spring it suddenly began to feel like Spring, with warmer days (but still chilly nights) and heavily pollinated air (achoo!). I completed a work deadline two weeks ago so I’m having a few weeks ‘break’. There are single quotes on that last work because in the first week I did plenty of physical work: gardening, cleaning up outside, cooking for Paul’s birthday. And for two days of that week I was sick, too. Then on the second Sunday I decided to do something completely frivolous. I downloaded a wardrobe organising app called Stylebook and over the next week, whenver it was sunny enough that I had good light, I photographed, entered and categorised most of my clothes. The app enables you to put together ‘looks’ – a bit like a paper doll minus the doll. Obviously I’m not going to add all my underwear and such, or the trackie dacks and old cargo pants I do the gardening in, as the former is waaaay too much detail and the latter hardly going to be part of a ‘look’. I’m not sure I really needed to put all my tshirts in either, to be honest, as tshirt plus jeans is hardly a creative ‘look’. Where the app is most useful is in pairing up clothing in new and (hopefully) stylish ways, and that’s most relevant to the nicer end of the wardrobe. It wasn’t long before it became clear that the reason I don’t wear some items is because nothing else I have goes with them. In those cases I could make one of two decisions: get rid of it or buy something to match. Since I have plenty of clothing as it is, I’ve mostly chosen to remove the item. In only one case am I sure I need to buy a new item, though the app did draw my attention to one match I hadn’t considered that might work, so we’ll see. That’s the other benefit: the app has me easily considering matches that weren’t obvious. I thought I needed another evening top, since I only had one. But looking through the tops in my ‘neat casual’ category, I can see some pieces that would definitely work as evening wear in the right situation. Down at the casual end of the wardrobe, I wasn’t surprised to see I have lots of long sleeved tshirts and skivvies. This is because I’m sensitive to wool, so need to have a barrier between my skin and the many handknits (and handwovens) I’ve made or bought. Every year or two I cull out the black ones that have faded and buy replacements, and having handled and inspected what I had I realised that time had come again. But as I looked at this category in the app, I realised I don’t need to. I have no trouble combining colours, so why have these in black at all? When black fades it looks old. When colours fade they just look like lighter versions of that colour. Not only do I not need to buy more black long-sleeved ts & skivvies, but I can probably not bother buying them ever again! Then I counted up all the casual summer tops and dresses and realised I had enough to wear something every day for all but ten days of summer. That’s ridiculous! But I’ve got there because I tend to refashion Paul’s shirts and too-small tshirts into sleeveless tops, and I have a weakness for convention and souvenir tshirts. So I culled a few I didn’t like so much and didn’t fit well, and relegated a handful of tshirts to the pajama top pile, and got the overall number to two months. Of what I’ve culled, five of the best pieces went to the op shop (where I overheard one of the staff say “ooh, that’s pretty!”), I’m hoping to hand at least one of three skirts to a friend, and the really worn things went into the rag bag. I was worried that the app would make me want to buy more clothes. Instead it’s shown me that I probably don’t need to. It’s helped me say goodbye to a few pieces I don’t wear (and I’ve found a new owner for one already) and shown me some new ways to wear what I have. It’s pretty robust, and hasn’t crashed or lost information yet. I wish it had a way to show the proportion of handmade/refashioned/bought second hand/bought new as well, but I was able to add ‘refashioned’ and ‘second hand’ into the notes for each piece so a search brings them all up, and I can see how many items I’ve marked as such. I did put ‘handmade’ in the Brands section, so my stats show that 20% of my clothing was made by me. I’m pretty chuffed about that. I don’t know if the app will be useful in an ongoing way, but it could be if I find myself doing some unplanned shopping. If I was tempted to buy a garment I could tell myself I must find five garments it will go with. Or if I was stuck on a delayed train or in a waiting room I could entertain myself making new ‘looks’. But even if I have no ongoing use for it, I have had a lot of fun already and got some useful insights. That was well worth the $5.99 it cost! Earlier this year I had a look at my small collection of VÄV magazines and saw there were some holes. I buy them when I see them at one of the local newsagents, which isn’t the most consistent way of getting them. So I popped onto their website and ordered three back issues. Two turned out to be of particular interest. One covered boro boro – the art of recycling and mending. Another featured adventurous weaving techniques and materials. 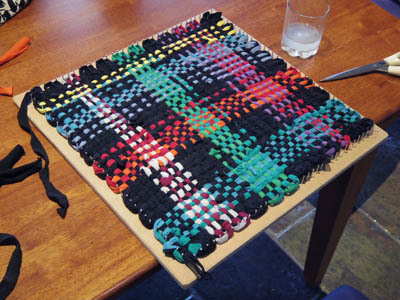 In the latter I read about an Estonian textile artist, Kadi Pajupuu, and one of the techniques she is shown playing with is weaving with multiple small heddles. From the looks of it, she is simply flipping them. But what caught my eye was the thicker thread between sections of weaving used as a supplementary warp, just like what I did with the Coco Nut Ice Scarf… except she was moving them around as she flipped the heddles. Suddenly it was obvious that the next step from the Coco Nut Ice Scarf was to start swapping around the thicker threads. I didn’t want to flip heddles, as she had, because that shortens the warp threads at the sides faster than the middle. But I did want to do something different to what she’d done: see if I could easily weave the ground warp threads on their own while the thick threads were crossing or twisting or whatever I would up doing with them. It turned out to be simple and intuitive and fast. By having the thick threads as a supplementary warp, I could move them into position in the back as well, and keep the warp tension even. I kept it simple, just crossing the threads over. I love the resulting scarf. 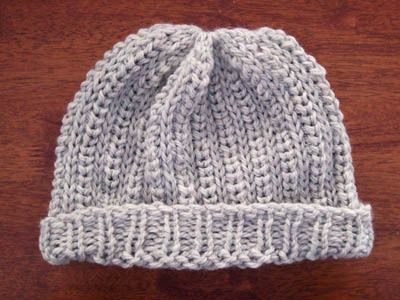 I wove it from alpaca, so it’s soft and plush. And there are so many directions I could go with this idea. But I’ve had yet another one, and this time it involves doubleweave and two heddles. 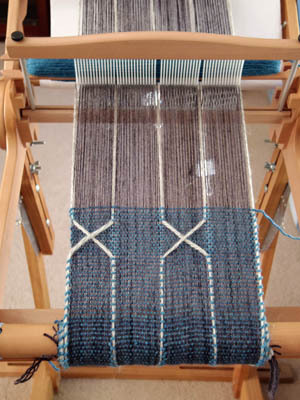 Recently the guild held a “See Yourself Weaving?” Open Day. I was all fired up to help out, but when Paul’s slipped disc happened and I got plantar fasciitis again I had to pull out of most commitments, including this one. However, by the time the Open Day came around Paul was well enough to drive me to the station, and my feet were good enough to get me to the guild via public transport, so figured I could participate so long as I got to sit down. I had one day to get organised. My original intent was to demonstrate pin loom weaving and stick weaving, but I kept the organisation down by deciding not to set up stick weaving. I concentrated on getting my triangle and hexagon looms warped up and with a few rows of weaving done, ready to demonstrate. The square one would be to show how it all starts. 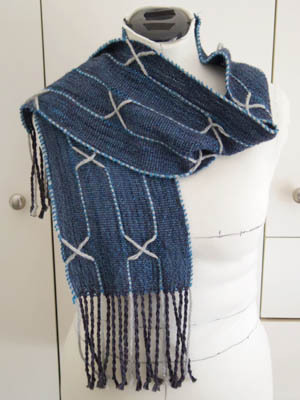 For examples of what to make I took the Hunky Hank Shawl, Graduation Blanket and Greenery Blanket – the latter so I could tell people that you can scale up the basic square pin loom for thicker yarns. 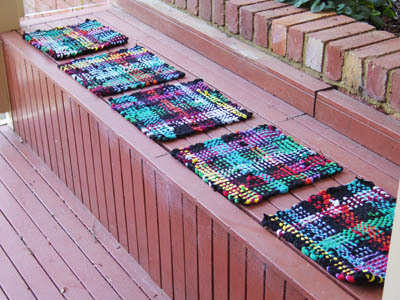 Then I thought… I have always wanted to try weaving rags on a pin loom. So I gave it a try on the loom I made for the Greenery Blanket, but the rags (leftover from the Braided Spectrum Rag Rug) were too thick. 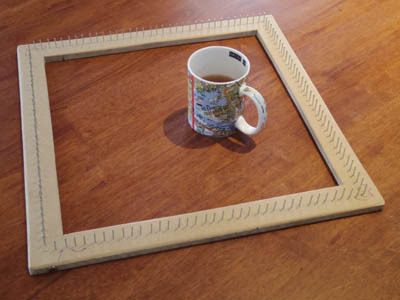 So I decided to make another pin loom – this time double the size of the basic square one. I warped up and started weaving, but stoped with only a quarter done so that people at the Open Day could see the process was the same. It was a great day, with over a hundred people coming to check out all the different kinds of weaving on display. Someone had already set up a couple of stick looms so I demonstrated those as well. I didn’t a chance to look around myself, I was so busy! 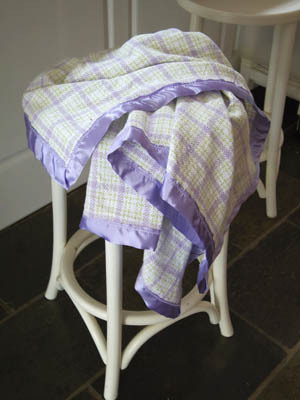 When I got home I finished the rag rug square and decided it would be perfect as a seat pad. So over the next week I made five more, stopping only because I ran out of orange rag ‘yarn’. I have two of these built-in seats. Looks like four or five pads is a good number for each. So I need to make at least two more, and I just found an orange t-shirt at an op shop to cut up. 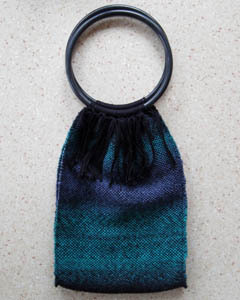 I really enjoyed making them, and now I want to make a huge pin loom and see if I can make big floor rugs. 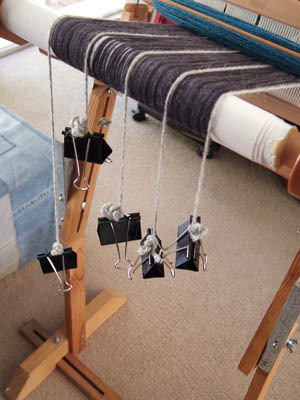 Oh – and the other great result of the Open Day is I sold my Ashford 4-shaft table loom! A new weaver and I got chatting and she said she wanted a four shaft loom, but she wanted a bigger one than what they have at the guilds so she can make large items. 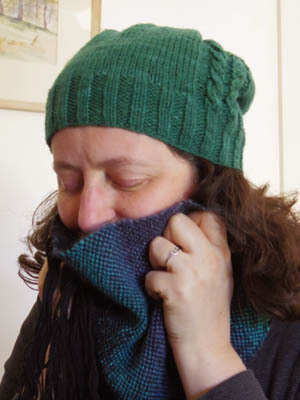 She came over a few weeks later to look at the loom, and it was exactly what she wanted. I’m so happy it went to a good home! Somehow I managed to miss two drafts when I counted how many I had left. So I had to squish five samples into the space for three. The third last wasn’t looking anything like the photo in the book. 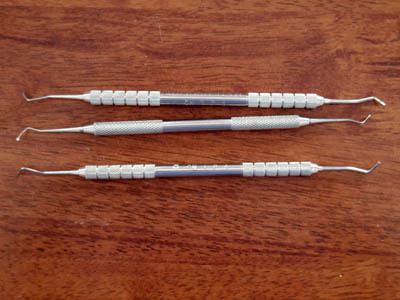 Then I twigged that the picks needed to be beaten hard. In fact, they should be for the last five drafts. Oh well. The first two weren’t, the third was, and the weaving of the last two got rather cramped as I ran out of warp so they’re probably not beaten as firmly as they should be. I tied a new warp to the old, this time a black one. I have six dark warp twills to do. 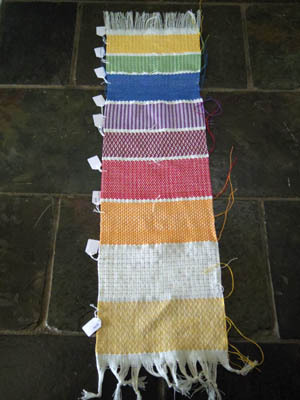 Then I’ll have all the multicoloured warp drafts to weave. Judging by the time I’ve spent so far, accepting that other projects and life will distract me, it may take the greater part of a year to weave everything in a chapter of the Strickler book. There are 24 chapters. Hmm. I don’t want to be finishing this in my 70s. But it is interesting. And fun, at times. Maybe I’ll keep going until it stops being fun. Maybe I’ll be more selective in which chapters to tackle, skipping to structures I haven’t tried before. You know, I don’t want to make weaving my job. I’ve turned hobbies into jobs before and it can take the fun out of them. 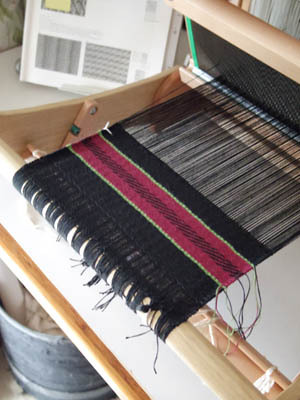 Yet there is something about weaving – and art – that makes me want more than enjoyment for enjoyment’s sake. I like that they both offer endless challenge and learning. I expect that’s how a woodworker feels about his craft. Or a hobby musician. 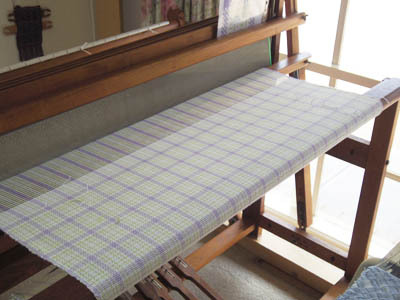 There was a discussion on a Ravelry forum for weavers a few months back in which a weaver of reputation heaped scorn on newer, hobby weavers for wanting drafts and projects for multi-shafted looms. Work it out yourself, she said. I’ve seen the same criticism levelled at weaving magazines for being project-based. Its fails to take into account that most people aren’t doing this for their living. They don’t have the time to dedicate to working it all out themselves. They probably never will. That doesn’t mean they shouldn’t be weaving at all, or never touch a multi-shaft loom. Writing suffers from this attitude, too. It’s like you can’t write and not be seeking publication. If you write for the pure enjoyment of it other writers think there’s something odd about you. And yet it’s fine to be a hobby painter, not earning money from art or entering awards. I figure if it’s fine to be a hobby painter, it’s definitely fine to be a hobby weaver, too. So for four weeks of August we put aside most of the unrecycleable plastic we would normally throw away. What didn’t get put aside was all the medication blister packs – Paul realise they counted as non-recyclable packaging to collect for the month. I’ve read that anything smaller than your fist will fall through the sorting machine at the recyclers, so I’m putting these into larger containers of the same kind of plastic, and labelling the container to indicate this. Hopefully that’ll get them through the system. The sorting machines can’t see black plastic, so we’re switching yoghurt and diet meal brands to ones that don’t use it. Christmas pudding is only a yearly indulgence and the container is a really good size scoop for potting mix, seed raising mix, etc., so those will be repurposed. We’re changing the brand of butter to one that uses paper, and Paul is switching to Quick Oats which come in a cardboard box. I’ve bought a metal razor. This is gonna be interesting. Paul is not keen on the idea. Fair enough. He does a lot more shaving than me! The only biscuits we buy are crackers for cheese. I made oat cakes and they came out great. Don’t know why I didn’t try that sooner. We were already buying carbonated drinks in cans and glass bottles, since large plastic bottles make you drink more than you really want because you feel like you need to ‘use it up’. To avoid ending up with lots of bottles here after parties we’re going to supply cans for gatherings and tell people we’ve got drinks covered. We’ll just use olive oil and avoid the spray. I’m going to do what Mum used to do with rubber gloves – cut them into rubber bands. They’ll be good for holding the beeswax wraps I made onto the tops of containers. The ice cream container can collect batteries for recycling at Aldi, and the wire ties will be reused when we get bread from the bakery. Medication blister packs can be dropped off to Terra Cycle collection points, so we’ll start collecting them now. I bought paracetamol and ibuprofen in recyclable bottles… but the bottles are smaller than my fist and the caps have no plastic number on them so I may as well stick with blister packs. I believe there are Terra Cycle collection points for dental products, too. I’ve offered to collect friends’ cosmetic packaging to send to Terra Cycle at the end of the year, or when I have 7kg worth. 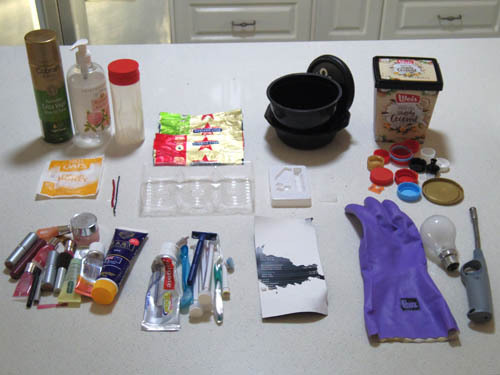 Overall we didn’t have an awful lot of non-recyclable packaging over the four weeks, but most of what we did get can be pretty easily avoided – or send to Terra Cycle. It’s been interesting and educational looking into alternatives. I want to ring the real estate agent and tell them to stop sending us stuff, but I know Paul will be really sad when he doesn’t get his free hot cross buns at Easter. Do schools like to make stuff out of those flat plastic fridge magnets? 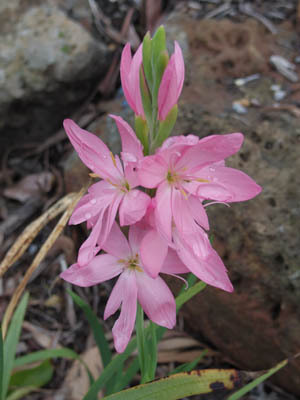 It seems like, for a while now, whenever I did any gardening there was nothing worth taking photos of. It’s been mostly mulching, mulching and more mulching. But while I’ve not been producing much to blog about, the garden has been growing. And finally something worth photographing happened. They are a little smaller than the first two, because I decided to put in beds set at 90 degrees to the others so there would be spaces in which to put my chairs and table, and a few pots for seasonal or perennial edibles. I’ve had some great successes with the first two wicking beds. A couple of failures, too. It’s a matter of learning what works here and what doesn’t. This part of our block doesn’t get more than a few hours of sun in winter, due to a huge gum tree next door, but I’d rather have the beautiful tree and its shade in winter, than sun beating down on us in the late afternoon in summer. For the last year or so I’ve been planting flowering plants on the embankment beside the kitchen garden, vaguely following the “plant something in flower every week and you’ll have something flowering throughout the year”. It was more like a handful of plants once a month, and I didn’t put anything in during the coldest months because, well, it was cold and other things were happening. But I can patch those gaps over the next year. A few weeks back we had a flock of between 150 and 200 yellow-tailed black cockatoos fly past. We’d seen them around in growing numbers, then this one afternoon they came from all around and gathered down by the creek, before flying away. The bird life here is wonderful, but that was extraordinary. Our ornamental pears are out in blossom already. The lemon tree is full of lemons all ripe at the same time, so plenty of lemon cordial and lemon juice ice cubes to be made. 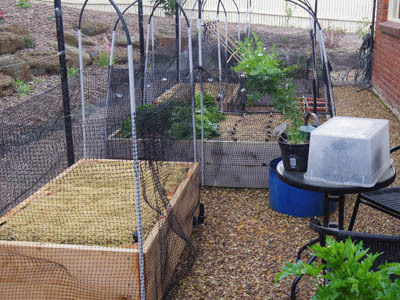 The plastic box in the pic above is my diy hothouse for the tomato seeds I’ve sown, and I have beans, snowpeas, carrots, basil and pumpkin seeds waiting to go in. Spring is not far off.